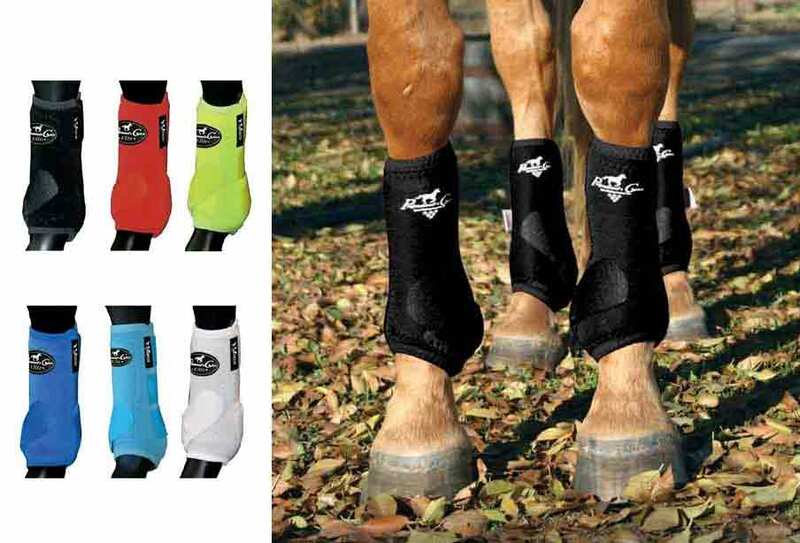 The VenTECH Elite Horse Boot Value Pack from Professional's Choice is a great way to keep your horse protected no matter what the discipline. This pack includes 2 front and 2 rear boots. They are lightweight and multi-layered with an exclusive limestone-based neoprene exterior with an UltraShock™ lining, providing 360 degrees of protection. These boots are designed to safeguard the cannon bone, tendons and soft tissue, and is proven to absorb energy from hoof impact by over 26%. There is a uniquely designed suspensory strap which stretches upon each impact of the hoof, allowing full ankle movement and helping to eliminate hyperextension of the fetlock. The distinctive angle of this strap also guarantees proper application, ensuring the boot provides maximum protection for your horse. Small - FRONT: Boot Height 10", Circumference 9.5"; REAR: Boot Height 11", Circumference 10.5"
Medium - FRONT:Boot Height 11", Circumference 10.5"; REAR: Boot Height 12", Circumference 11.5"
Large- FRONT:Boot Height 12", Circumference 11.5"; REAR: Boot Height 12.5", Circumference 12.5"
Contoured strategically placed darts on both the inner and outer sides of the boot ensure a perfect, glove-like fit, keeping dirt out . Multi-layered with exclusive limestone-based neoprene exterior and UltraShock™ lining. Shock-absorbent proven to absorb energy from hoof concussion by over 26% and safeguard the cannon bone, tendons and soft tissue. Suspensory strap stretches upon each impact of the hoof, allowing full ankle movement and helps to eliminate hyper-extension of the fetlock.